Is PSY's "Gentleman" Video Just a Giant Commercial? Well, PSY's newest music video "Gentleman" looks like a smash hit. It also looks like it might be filled with product placements. Go figure! As Kotaku previously mentioned, mobile game Candy Crush Saga appears in the "Gentleman" video for several seconds. There are rumors of a big payout. But this isn't only alleged product placement in the music video. According to Korea's ISplus (via tipster Sang), Candy Crush Saga's developer King.com is rumored to have paid the equivalent of US$1 million for a three second product placement. In the "Gentleman" video, you can clearly see the game's title and a second or two of gameplay. If true, that would make this three second product placement more expensive than a Super Bowl commercial. During this year's Super Bowl, $3.8 million bought around thirty seconds of airtime. PSY's management is quoted as saying, "We have not heard about such an endorsement contract," adding, "We aren't even sure if the $1 million dollar amount is correct or not." News site MK is claiming that PSY was paid to promote Candy Crush Saga; however, the exact amount he received isn't known. Keep in mind, PSY's management seems to be denying these allegations. Noted! In another scene, you can see Double A paper, which is a copy machine paper brand, stacked in the background. It's unconfirmed whether or not this is product placement. However, the Double A name is prominently displayed. And in yet another scene, you can see a brand of beer called "Hite" and a brand of soju called "Chamisul". According to PSY's management, the alcohol was placed there free of charge as a token of gratitude. See, PSY is their spokesperson... Oh. Wouldn't that be product placement? According to MK, "Gentleman" hasn't yet been shown on Korean television. PSY's management said it would re-cut the video for broadcast to apparently comply with rules about how products are shown. 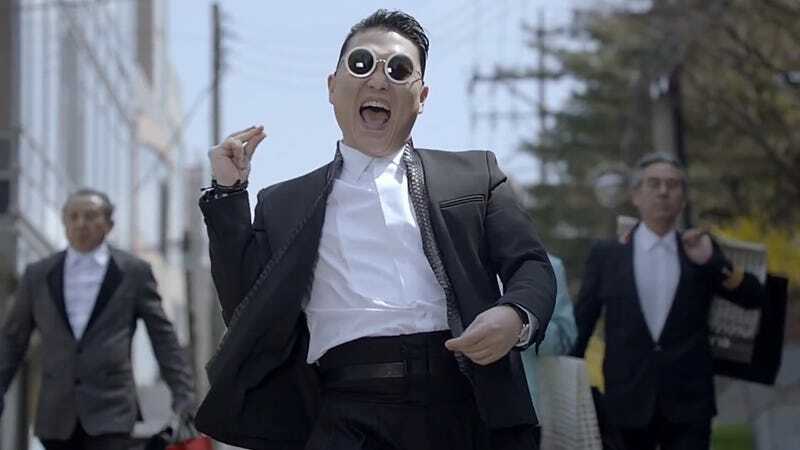 Watch PSY&apos;s Newest Music Video, the Follow Up to "Gangnam Style"
Kotaku is following up with King.com and will update this post should the company comment.